It is believed the "PNP" in his signature stands for "Professor of Natural Philosophy." Note that Kelvin also wrote under the pseudonym "P. Q. R."
Weaire–Phelan structure for a solution to the Kelvin problem regarding partitioning space. ; Tait, P.G (1872)។ Elements of Natural Philosophy។ (reissued by Cambridge University Press, 2010. ISBN 978-1-108-01448-9) 2nd edition, 1879. Wikisource has the text of the 1911 Encyclopædia Britannica article Kelvin, William Thomson, Baron. 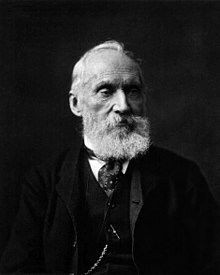 O'Connor, John J.; Robertson, Edmund F., "William Thomson, 1st Baron Kelvin", [Expression error: Unrecognized punctuation character "១". MacTutor History of Mathematics archive], University of St Andrews, http://www-history.mcs.st-andrews.ac.uk/Biographies/Thomson.html . Quotations. This collection includes sources for many quotes.